Although a fire, explosion or prolonged exposure to fumes on board a boat would be highly dangerous, these types of incidents are very rare simply because the overwhelming majority of boat owners are only too aware of the risks and are familiar with all the safety precautions and procedures. The main risks are the refuelling of petrol-engined boats, the bottled gas cylinders which are used for heaters, cookers and fridges and poor ventilation which can lead to carbon monoxide poisoning. Firstly, you should have already put into place a planned and well-rehearsed strategy for what to do in the event of a fire or explosion on board. Any preparation should incorporate ensuring that all main and secondary routes leading from any accommodation areas always remain clear with no obstructions. You should also have fire extinguishers and blankets fitted and appropriate to the types of fire you might encounter onboard which should be easy to access and kept well-maintained and know how to use them. Additionally, you should make sure that all flotation devices such as lifebelts, lifejackets and liferafts are also in good working order and that there are enough for the number of people onboard and that they too are easily accessible. If a fire does break out, it’s crucial that you get everybody out of any accommodation area and onto the deck and call for help if the fire threatens to get out of control. If you think you’re able to tackle the fire, do so and reduce the chances of it spreading by sealing off any vents and hatches as well as isolating any petrol or gas if it is safe to do so. It’s important that everybody on board moves as far away from the fire as possible and doesn’t return to any cabin or interior space which is full of smoke. However, if the fire continues to grow and help has yet to arrive, do not hesitate in abandoning ship launching a liferaft if you have one or using other flotation devices. Make sure that all of your equipment which uses any type of fuel is checked and serviced regularly and that all people on board are aware of the location of fire fighting equipment and flotation devices and know how to use them. Always remember to switch appliances off when they’re not being used and always ensure that there is adequate ventilation that is kept open and free from obstruction. This is particularly crucial if you intend using a solid fuel burner overnight as you’re asleep as carbon monoxide is a silent and virtually undetectable killer so it’s also important that you have both smoke and carbon monoxide detector alarms fitted. Never refuel on board - always ashore - and before refuelling, you need to turn off your engine and all cooking, lighting and heating appliances, close all doors and hatches, extinguish any smoking materials and naked flames and keep a close watch on your fuel level to avoid overfilling. Make sure any fuel spillage is thoroughly mopped up and that you allow time for ventilation for the petrol fumes to dissipate before starting up the engine or igniting any other naked flame. Ensure that all gas cylinders are stored upright with the valve at the top and that all appliances which run off gas or other types of fuel are fully secured and stable in the event that you have a collision or even when the boat is bobbing from side to side, these kinds of appliances should be virtually immobile. Make sure that you follow the correct procedures when you’re changing any gas cylinders and that you adopt safe procedures for the storage of cylinders in terms of allowing for adequate ventilation. There is plenty of information about fire safety on board boats available so familiarise yourself with all the dos and don’ts and make sure that everybody on board is equally aware of the risks and about proper fire safety procedures. In the event of an onboard fire, surely the first thing to do after ensuring everyone's safe and ready to abandon ship if needed is to assess the blaze whilst still keeping yourself safe. 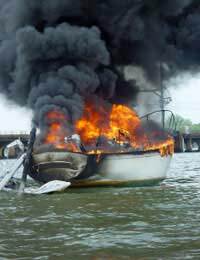 Remember that a boat is made from fibreglass, wood and plastic for the most part, and those three things can burn quickly. Granted, fires are pretty rare, but also, looking long term, make sure that you're well covered through your insurance policy or you could lose everything.